In what scenarios would 1Gbps of internet bandwidth be used for a sustained period? Cloud storage/backup to a cloud in NZ is one I can think of. And how many cloud storage providers are there in NZ that would not limit in/out bandwidth to something more realistic? Not many, if any. Or 2 people with a 1Gbps connection transferring large data, maybe a VPN. 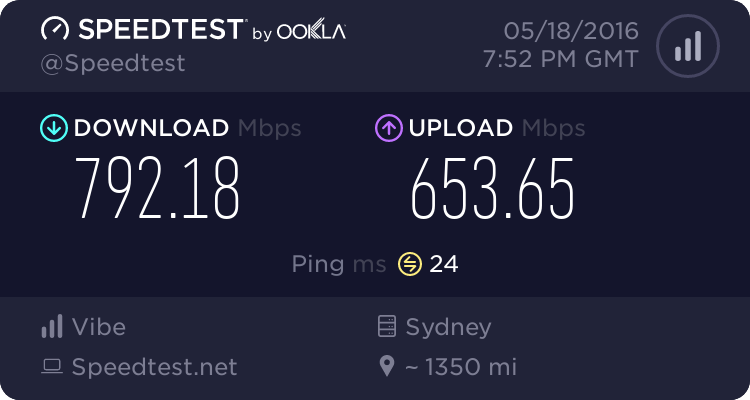 The most common use for a 1Gbps connection I can see is for producing awesome speedtest result screenshots. Any existing Gigatown user's who can comment? Yeh well its all burst, so it will slow down if it gets over subbed. 3) backhaul for that provider might choke. The reality is, most home users don't need 1gig/500mbps but im not gonna complain, its a nice to have all that burst. And the are offering the tails for a pretty good price why would you not order one. 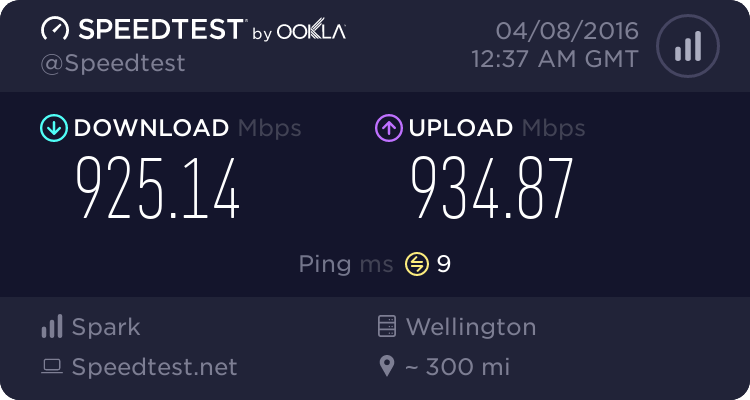 My mate in dunedin has only ever had about 650~700mbps download but thats pretty good IMO. I wonder how people will go with unlimited. darylblake: 1) PC Unable to sustain gigabit speeds due to under powered machines. 53) backhaul for that provider might choke. Under powered machines and poor wifi is far more common I would say. mcraenz: In what scenarios would 1Gbps of internet bandwidth be used for a sustained period? 40 households streaming 4k content(25mbps) on netflix at the same time. That being said there's people that use huge amounts of bandwidth just because they can(ie people on adsl2 connections doing 3-4TB a month of a potential max of ~7TB via constant connection at max speed. Someone could easily decide to download 200GB via usenet at peak hours at say 150mbit which would take 3 hours. Get a few people like that in 1 area and it becomes an issue. Yeah that is good. That's the maximum I get with my laptop directly connected to another computer (sitting next to each other). It must be the limit on my 1 Gbps NIC - not that I expected a laptop to be that great. Ahem. I seem to have lost my composure. Hmmm, how does that pricing compare to the other LFCs? Detruire: Hmmm, how does that pricing compare to the other LFCs? Not to mention the fact that until RSPs start reselling the service from the LFCs, for the end user it's practically meaningless - the product is technically available, but there are pretty much no channels to take advantage of that. We've got to wait until some of the bigger RSPs bring the offer on board - basically at this point we've got three of the smaller RSPs and no one else (BigPipe, MyRepublic and FullFlavour). I'm still coming to grips with having fibre at all, let alone bigger faster better fibre. And isn't this already dated now....?? ?